Last night’s educational event at Evolutions Medical Spa highlighted the dermal filler Radiesse. Greg, our representative from Radiesse, did a thorough presentation that explained what Radiesse is, how it is used, and who can use it. He also showed many impressive before-and-after pictures of Radiesse that illustrated what a difference Radiesse can make in someone’s face. What is Radiesse Wrinkle Filler? Radiesse is an injectable filler that contains tiny calcium-based microspheres which are made of components similar to those found naturally in your body. Radiesse instantly restores fullness to smooth out signs of aging and has the beneficial side-effect of stimulating our own natural collagen! Results are instantaneous and may last one year or more and is a more affordable wrinkle correction for a broad range of patients. Radiesse is the only calcium-based filler. Other dermal fillers, such as Restylane and Juvederm, are made with hyaluronic acid and are not known to stimulate collagen. Why would I need Radiesse? As we age, our nasolabial lines and marionette lines deepen, and our cheek and eye areas lose volume. Natural collagen begins to breakdown creating loss of elasticity and wrinkles. The lower face begins to take on more of a broad square shape as opposed to the upside down triangular shape of a youthful face. Radiesse wrinkle filler provides volume and lift needed to diminish the signs of aging for visible, long-lasting results. What is the difference between Radiesse and anti-wrinkle treatments like Botox or Dysport? Botox and Dysport are muscle relaxers that are typically used in the forehead area. Dermal fillers, such as Radiesse, are typically used in the lower part of the face (from the eyes to chin) to replace volume. We would not want to use Botox or Dysport in the lower part of the face because you wouldn’t want to stop the muscles from working in that area. Instead, a dermal filler would be used to replace the volume lost. What is a Radiesse treatment like? Now Radiesse can be mixed with an anesthetic (lidocaine) prior to injection to increase the comfort level. Clinical studies have shown that people felt a 60% reduction in pain level during injection. There is no downtime after a treatment. A person may want to use a cold pack to reduce swelling and the chance of bruising and any exercise after the treatment is not recommended (on the day of the treatment). The day after treatment you can resume any exercise activity. Radiesse is ideal for a broad range of patients for instant correction of moderate to severe wrinkles. Those who should not use Radiesse wrinkle fillers are people who are pregnant, breastfeeding, or have an active infection in the area to be treated. If you would like to know how Radiesse, or other dermal fillers, can benefit you, please call Evolutions for a complimentary consultation at 805.687.0212. Don’t miss out on this!! Evolutions Medical Spa and Santa Barbara cosmetic surgeon Dr. Terry Perkins will be hosting a “Look Radiant with Radiesse” event about dermal fillers. Dermal fillers can help a person “turn back the clock” and enhance their features (cheekbones!) by filling in wrinkles, and other depressions in the skin. 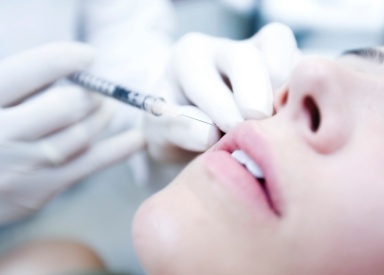 Dermal fillers contain naturally-occurring substances in your body. The results are instantaneous and can last for one year or more. The event includes refreshments, a raffle, and exclusive specials including the pre-purchase of any dermal filler syringes at a great price. RSVP to Evolutions at 805.687.0212 to reserve your spot! Are you interested in looking years younger without cosmetic surgery? Then mark your calendars for our Dermal Fillers 101 event on Wednesday, April 27th! Santa Barbara cosmetic surgeon Dr. Terry Perkins and Evolutions Medical Spa are hosting one of their most popular educational events of the year – don’t miss out! Dermal fillers (including Restylane, Perlane, Juvederm, Radiesse, and Prevelle Silk), which contain naturally-occurring substances found in your body, are used to fill wrinkles, and any other depression, in your skin. They add natural volume and lift that many of us lose over time. Results are instantaneous and can last from six months to one year or more! Learn about the Layered Liquid Lift, a non-surgical face lift, developed by Dr. Perkins that can turn back the clock by 10 years for you! Watch a video of Dr. Perkins performing a Layered Liquid Lift on a patient, see the difference from before to after! Dr. Perkins will perform a live filler demonstration! Raffle, refreshments and exclusive specials for attendees! Please RSVP to Evolutions at 805-687-0212 – seats are limited! The Dermal Fillers event will be held at Evolutions Medical Spa Santa Barbara, located at 1309 State Street on Wednesday, April 27, 2011, from 6:30 pm – 8:30 pm. Evolutions Medical Spa’s most popular week of the year, Injectable Week, starts tomorrow, Monday, November 29th and runs through Saturday, December 4th, 2010. Look your best for the holidays and beyond! Once a Year specials on anti-wrinkle treatments of Botox and Dysport, and dermal fillers Restylane, Juvederm, Radiesse, and Perlane. Call Evolutions Medical Spa Santa Barbara at 805.687.0212 to book an appointment! Join us this Wednesday for a special presentation on Radiesse, an injectable dermal filler used for wrinkle reduction that instantly corrects wrinkles, lasts up to one year or more in many patients and stimulates natural collagen production to further your skin’s youthful appearance! Santa Barbara cosmetic surgeon Dr. Terry Perkins will perform a live demonstration of Radiesse on a patient – see instant results with your own eyes and pre-purchase syringes at the best price of the year! And learn about how you can look great for the holidays at Evolutions Medical Spa’s Most Popular Week of the Year – “Injectable Week”. Mark your calendars! Injectable week is November 29th – December 4th. Seating is limited, please RSVP to Evolutions at 805.687.0212. The event will be fun, informative and there is no cost to attend.